KTEWU said that more than 80 per cent of the teachers are against implementing of NEIS because it��s violating the human rights. 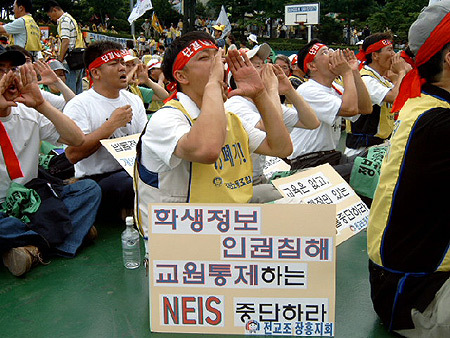 The Korea Teachers and Educational Workers’ Union (KTEWU) has long opposed the NEIS - see also our article “Human Rights Activists in South Korea start Hunger Strike against National Education Information System (NEIS)” , an online database of personal student information. The union cites legitimate security concerns for its opposition to the system, which initiated and supported by the ministry of education. 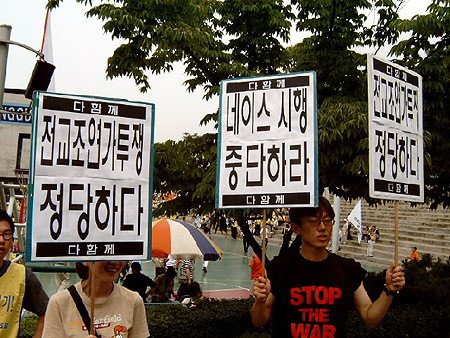 After a four-day sit-in struggle last week in Seoul’s Hullyeonwon Park, to show their strong opposition against NEIS last Saturday the teachers organized in the KTEWU took the streets of Seoul. In the morning they started the protests with a rally organized by local members of KTEWU. 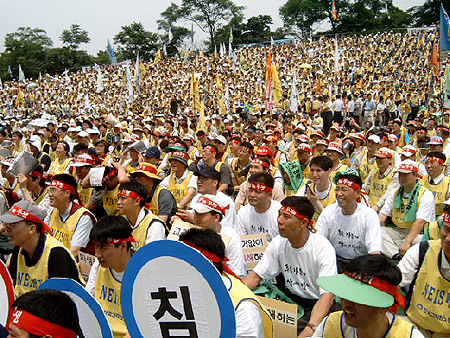 In Hullyeonwon park more than thousand teachers, supported by Da-hamkke (All Together) and Minju-nodong dang (Democratic Labor Party) members. 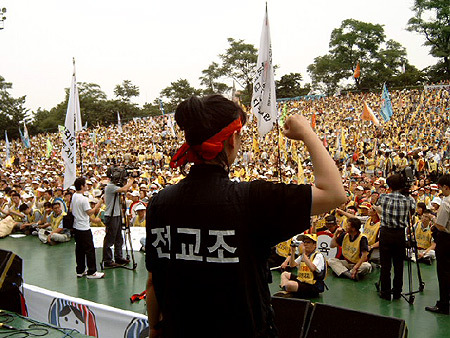 In several speeches they condemned NEIS its threat for the personal rights of 8 million students in South Korea. The organizers of the rally also presented revolutionary music and dances performed very impressive by a group of unionists. After the rally teachers and their supporters marched together in the direction of Dongguk University where the central rally took place. Here thousands of teachers from all of South Korea followed a program full with speeches and performances against NEIS. Also here they condemned the governments plan to implement NEIS. KTEWU demanded strong unity to bring the plan to fall. 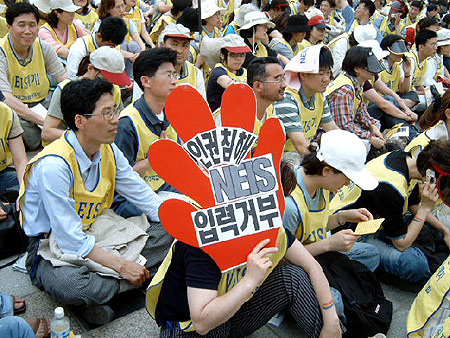 In a interview, Song Won-jae, the spokesman of KTEWU said that more than 80 per cent of the teachers are against implementing of NEIS because it’s violating the human rights. “Actually only an infinitesimal minority of the teachers wants to use this system. So it means if the majority of us don’t fill the system with data - NEIS is death”, he said. For the question if the government can punish the teachers for rejection he answered that there is no legal law for implementing systems like NEIS, “So, the government has nothing in the hand against us even if we continue to refuse to use the system”, he said. But Lee Yeong-guk, a music teacher from elementary school in Seoul said: “Even the government will create a law for to punish us for refusing to use NEIS, many of us also would `like` to go in prison for this `crime`”. 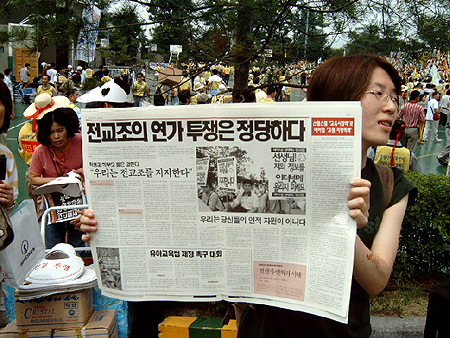 After the main rally thousands of unionists and other political activists marched to downtown’s Eulji-ro, one of Seoul’s main avenues, where the final rally where held. Meanwhile the teachers and their supporters struggle for democratic rights the government shows us how it understands democracy. South Korean government said on Sunday that it wants punish teachers who participated in Saturday’s one-day walkout in protest of the national education information system. According to South Korean daily JoongAng Il-bo from Monday the Ministry of Education and Human Resources Development said it would cooperate with the police and the prosecution to punish major figures in the strike. All who joined will face administrative punishment, such as an official reprimand or a possible reduction in wages, the ministry said.